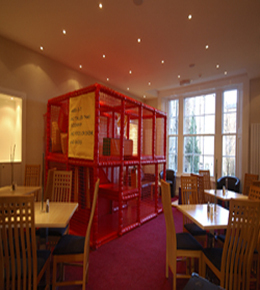 The new child friendly licensed bistro and restaurant. Breakfast, lunch, tea, coffee, snacks and evening meals. 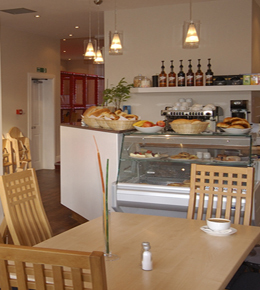 Fresh, healthy food in a really child friendly environment. Kids love it and you will too!. Easy to get to on Portobello High Street, 5 minutes walk from the seaside, with a soft play area for toddlers and an indoor climbing frame for the over 2's. It's a different, fun way to spend some quality family time. A delicious new eating experience for the whole family in a unique, happy atmosphere. There's something for everyone, of all ages. Reds has day, evening and childrens' menus with vegetarian options and a wide range of beverages and snacks in a well designed, relaxed, child friendly and safe environment. The wide entrance and inside buggy parking with the baby changing room are great if you've got kids. CCTV keeps an eye on your little treasures whilst they play and there's even a retro video games machine for the older kids ... and adults. With free parking nearby and easy to reach with public transport why not combine a visit with a day by the seaside! Reds is an enjoyable mix of bistro, restaurant and playground. Everything created with children of all ages in mind. See for yourself and try some family fun and food.